Obituary – Wilson, Carl Eugene « Perry High School Alumni Association, Inc.
– 17 year old son of Mr. and Mrs. T. B. Wilson lives at 737 Elm street. He was born April 23, 1922 in Drumright and has always attended the Perry schools. Carl played on the high school football team for the past four years, playing quarterback and played four years of basketball as forward. He also went out for track in 1937. In 1939 he was selected as the most valuable football player, receiving the Lions award, has lettered three years in football, two years in basketball and received a gold football this year. Another sport he is interested in is golf. He was a member of the glee club and the boy’s trio and quartet the past two years. He took part in the operetta presented last year. Carl is also a member of the local chapter of the Order of the DeMolay. His hobbies are athletics and dancing. He was vice-president of his sophomore class, secretary and treasurer of the senior class and secretary and treasurer of A. L. Ebersole’s home room class this year. He plans to attend Central State College in Edmond next year. 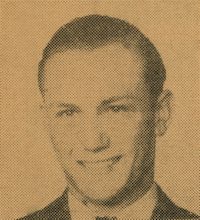 First Lt. Carl Eugene Wilson, 22, was killed in action in Germany on March 7, 1945. Son of Theodora “Toby” B. and Eunice (Delong) Wilson, First Lt. Wilson was born on April 23, 1922 in Drumright, Oklahoma. 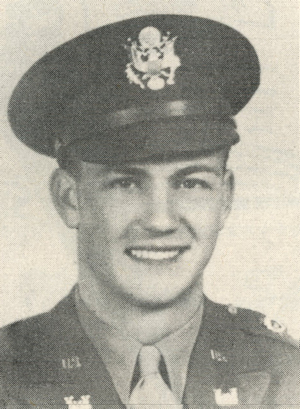 A 1940 graduate of Perry High School he entered the army in 1944 upon his graduation from Oklahoma A. & M. college, Stillwater, and was commissioned a second lieutenant in the army engineers. He received his promotion to first lieutenant in September, 1944, after duty at Fort Belvoir, Virginia. Word that Lieutenant Wilson was in Europe was received here in January, 1945, when he landed somewhere in France. In his last letter to his parents, dated March 4, 1945, the officer told his family he was getting along fine. The letter was written from Germany. In addition to his parents, also surviving are two brothers, First Lt. Bruce Wilson, who has been overseas for almost a year and now is in France or Germany, and Pvt. Earl Wilson, who landed in Italy in October, 1944, and is now in Germany with an infantry replacement company.